I’ve been a fan of Rachel’s Organic yogurts for awhile now, so when they asked me to review their new limited edition seasonal fruits multipack I was more than happy to oblige. 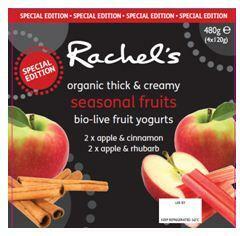 The multipack consists of 2 X 120g pots of Apple & Cinnamon yogurt and 2 X 120g pots of Apple & Rhubarb yogurt. These limited edition flavours promise a mouthwatering serving of Rachel’s goodness in wonderful seasonal flavours, but did they live up to my already high expectations? Next I tried the Apple & Rhubarb, again this yogurt displayed the usual Rachel’s creaminess, but neither the apple flavour or rhubarb were overwhelming. There can be a tendency for rhubarb to be overly sharp or stringy, but here it was subtle and well blended. Another very enjoyable yogurt. For me there was was really no contest though, the Apple and Cinnamon had to be the winner and I’d be happy to see it in larger pots and available all year round. 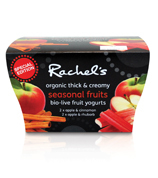 Definitely, they have the usual Rachel’s taste, but with fresh new seasonal flavours that are sure to please. Only it they were available in larger pots and become a regular member of the Rachel’s range. For more information about Rachel’s Organic and their products visit them online at www.rachelsorganic.co.uk. On the website you can also find a huge range of mouthwatering recipes!